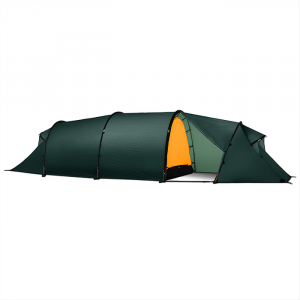 The Taku is a Goretex, single-walled tube style tent made to keep the cold out and the warmth in. The lack of vestibule, inability to free-stand, and leaky floor leave too much to be desired for the large price tag. The Taku utilizes three “hoop” semi circular poles to provide integrity to the tent. Each pole becomes consecutively smaller moving towards the foot. 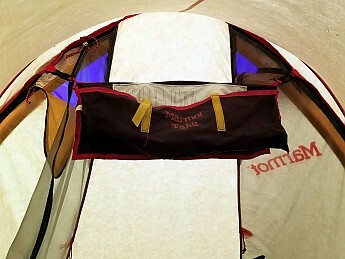 The first two poles are inserted into reinforced pockets in the interior of the tent. The third pole is put in place on the exterior of the foot of the tent. The interior poles are held in place by velcro straps (three each). 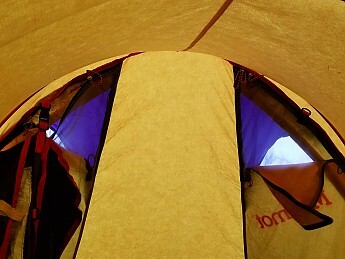 The exterior pole is kept stationary by tension under a fabric awning at the foot of the tent. This last pole is somewhat difficult to force into place. 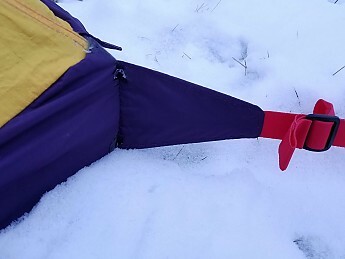 When conditions are really cold, gloves tend to slip right over the pole. Bare hands work better but tightly squeezing your bare hands around anodized aluminum in sub-zero temps is not for the faint at heart. In order for the tent to remain standing, it must be staked out to keep the poles upright. This is where potential problems arise. 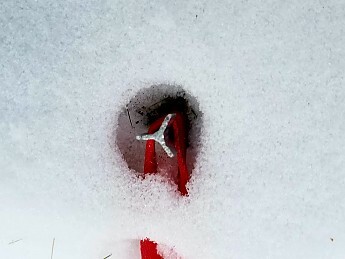 In freezing conditions, the ground can become rock hard; even the provided triangular stakes can buckle when pounded in. There are ways to mitigate this problem (tying off to logs or rocks and burying them, screw stakes, etc.) It’s not that there’s a lack of a way to get the tent to stand, it’s just that when you add these additional steps, a non-freestanding tent can become more challenging to pitch. Apart from this, the setup is rather easy. When staked and guyed, there are little worries with stability. Its low profile and height gradient allows wind to flow over it freely. Again, the staking of the tent plays a big role in how well the tent maintains its form. 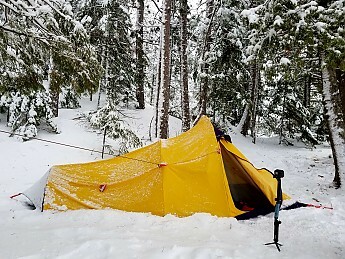 The good thing about the Taku is when conditions are not optimal for keeping it up (high winds, bad staking conditions), it doubles as a 2P bivy sack. Each door is crested with a durable arched vent. If you position your head under one, these vents will let air flow in and out of the bivy. Since there is one on each side, both users are ensured air. 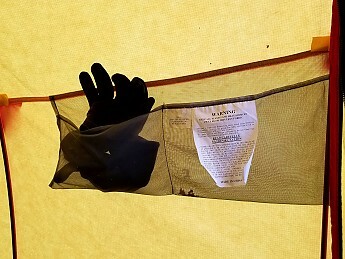 The upper of the tent is Gore-tex or Marmot proprietary material (depending on model). The fabric creates a great wind breaker and is reliably weather-resistant. 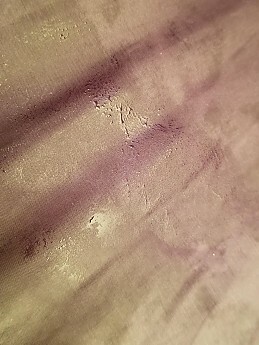 The interior of the tent fabric is coated with a felt-like coating. The increased surface area and fuzziness, add additional warmth. The coating also hinders the ubiquitous interior ice build up notorious in single-walled, four-season tents. I think that it’s quite ingenious and have wondered why companies have not continued using these reliable and true-tested materials. I haven’t noticed any drawbacks. At 5lb, the tent is a great deal lighter than most four-season 2P tents. 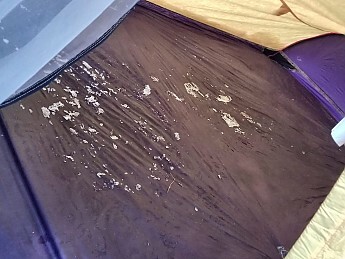 The seams of the tent floor have failed since the original owner purchased the tent in the '90s. Soon after my purchasing of the tent, I camped in a rainfall. Both the floor and the top leaked in multiple spots—all at seams. I noticed that the top interior of the tent was never sealed or taped to begin with. I think this is because the interior is fuzzy so a normal tape seam would not adhere. Instead of sealing the exterior, Marmot decided to leave that to the purchaser. 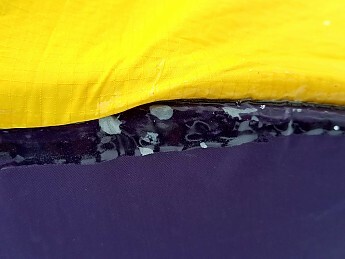 I resealed the exterior of the tent with seam sealer. The top exterior was difficult to seal because there is slight bunching of the material at the curved seams. It was difficult to properly apply the seam seal in the micro pleats. There was some bubbling. I camped out in a storm again. The top was waterproof but the floor still leaked in the corners. The hefty amount of reinforcing stitching and seams at the corners made it difficult to completely waterproof it. Much to my dismay, the floor material is no longer waterproof. When you apply pressure to the material, any moisture underneath (be it rain or snow) will seep through the fabric. Just to illustrate this, I pushed my warm hand down against the floor for no more than 5 seconds and lifted it. As you can clearly see in the picture, the snow melted and went right through the floor. This leaves a strong imperative to have a footprint with you at all times (increasing the weight and negating some of the lightweight advantages of the tent). 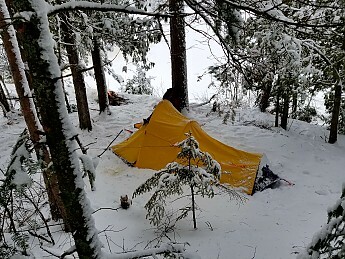 In addition, even with a Tyvek or other impermeable footprint, snow or rain inevitably creeps under the tent and between the floor and the footprint. This pretty much guarantees a wet mattress bottom by morning. Thank goodness that the outing in the pic above was only in the mid teens at night. That much water against your pad can really conduct away your heat quickly. I'm not sure when the waterproofing failed but at one point the floor used to be waterproof. The doors allow the elements to enter the tent when they are opened. There is no vestibule in this model. Instead, there’s just extended interior space at the head of the tent. This is a problem in rain but not that big of a deal in snow. 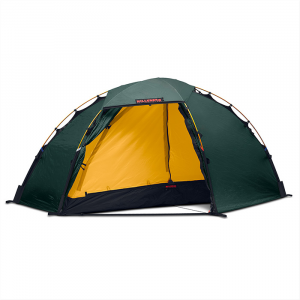 The arched vents on either side of the tent allow air flow but keep out the snow and rain. The drape over the foot panel screen keeps out precipitation as well. The Taku has double D doors that both unzip to full screen. There is also a foot panel that unzips to full screen. In conjunction with each other, they allow ample airflow even in warm conditions (the door panels being unzipped to the floor). In colder weather, a slight crack in the foot panel and doors keep condensation down to a manageable amount. In a full on storm, the tent can be zipped up pretty tightly. 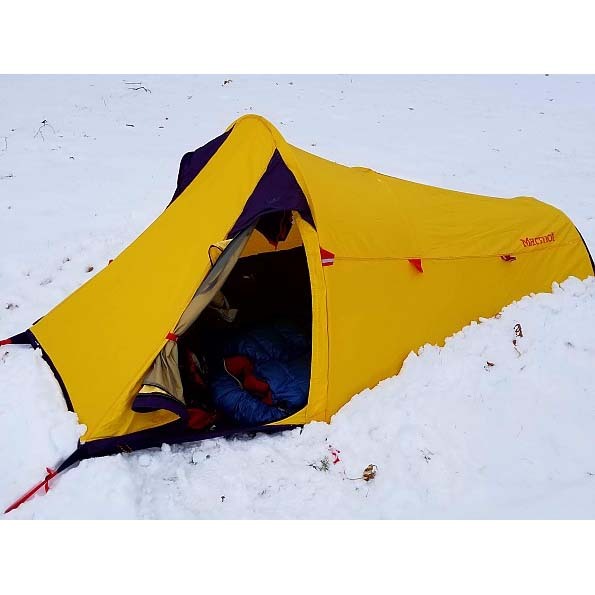 In heavy snow, I would recommend that the user still take precaution to allow a modicum of air to enter the tent. We all hear that Gore-tex is breathable but it doesn’t breathe enough to support a respirating human if closed off from the outside world. I use discretion in snow storms just as I would with an impermeable tent. The interior of the tent has a 54-inch berth at its widest. It narrows to 36 inches at the foot and the same width at the opposite end. The height at the tallest arch is 44 inches. There are two large double stow pockets (one on each side of the tent). 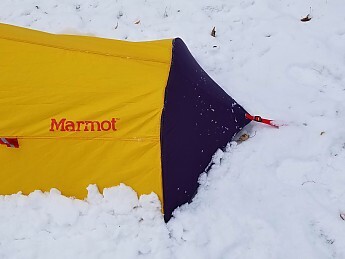 In addition, the “Burrito Bag” line of Marmot tents from this era allow the user to use the actual tent bag as an additional storage unit. 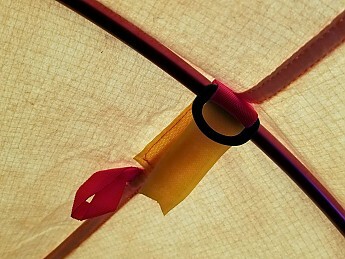 It cleverly clips to the interior of the tent. This provides a great amount of added space for the user/s. The single walled design turns the would be vestibule into livable tent space. This is a boon and a burden. 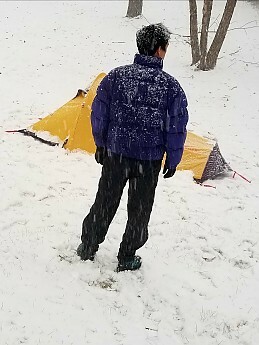 I like to have my pack and gear in my tent in the winter. With the Taku, you can just place it at the head of the tent in the additional space. 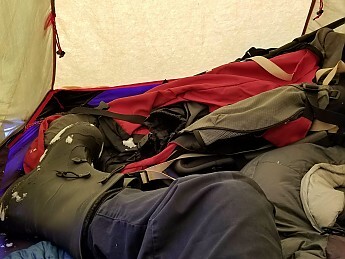 The drawback is that there’s no cooking space, and you drag more snow into the tent on average since you end up bringing the boots inside. Comparing the Taku with vestibuled four-season tents, I’d say that I like having a vestibule. The Taku is a burrito style tent. You don’t necessarily roll the tent, you fold it into a rectangle and then place it on one side of the burrito bag, the tent poles go on the other side, and the stakes fit nicely into a pocket on the inside of the bag. Once together, you fold the bag over and cinch it down with two velcro straps. It’s a tight fit but it works. I’d say that it’s a little more work than your traditional roll up and stuff in a bag tent, but you do get the added benefit of turning the bag into storage space as mentioned above. Once packed, the tent measures 8" x 18" approx. The Taku is an intuitive tent to use. There’s little to figure out with a three-pole tube design. 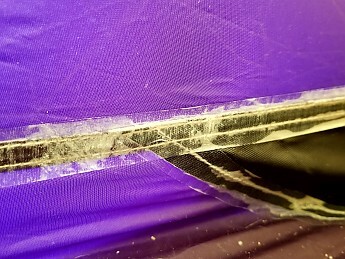 The foot panel flap can be difficult to unzip because the exterior pole at the foot of the tent butts up against the zipper and hinders you as you slide the zipper parallel to the pole. With the exception of the strap at the foot, the drawdown straps on the exterior of the tent are double fed through the cinching mechanisms. This makes it somewhat difficult to just pull them tighter. You have to wiggle them through to tighten them down. 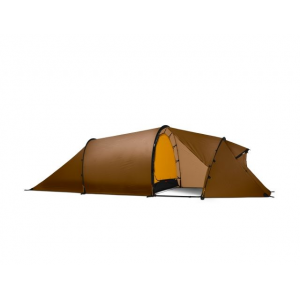 The tent requires this additional tightening after setup because the material stretches after a couple of hours and the tent loses its tautness. 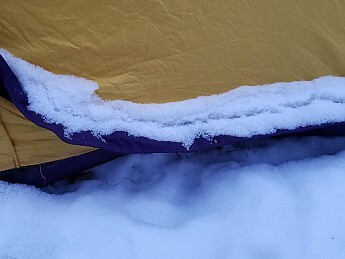 Post second adjustment, the tent holds its form very well and sheds snow effectively. 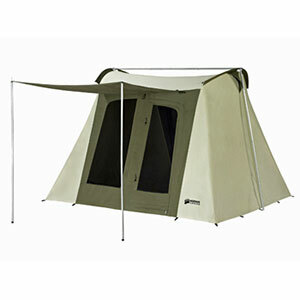 Double doors on the sides of the tent provide easy entry/exits to both users. Large amounts of space at the head of the tent. The Taku is crafted from quality materials that are meant to last. The Gore-tex is reliable. Minus the lack of impermeability, the floor is durable, the webbing is quality. The tape flakes like most tent tape will after a decade. The seams and webbing are reinforced. The doors are protected by an elastic flap and an awning. When the tent was new, it retailed from $500 to $800 dollars. 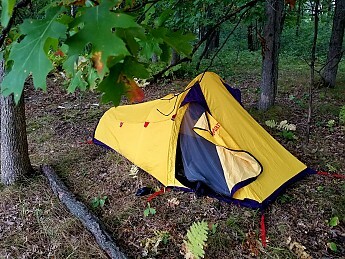 This high price point back in the '80s and early '90s meant that not a ton of them were sold, but one must be impressed that Marmot was able to produce an expedition grade 2P tent at the 5lb category so long ago. I just wish that it kept out the elements more effectively. If it did, I would overlook the other annoyances, but, if I can’t stay dry at sub 20°F, I’m putting myself at risk. Because there are some really great elements to the tent, I’ll continue to troubleshoot and add DIY modifications to see if I can get it to keep me safe. I created a footprint from a heavy mm plastic sheet. I tested the tent up north this past week in -5°F with snow. The tent did well and the footprint kept the water out of the tent. As you can see in the pic, the tent sags after a few hours. Since it's single impermeable, there was no need for alarm. The second pic is after I pulled the straps taut again. The stakes were tough to pound in and get out but I managed. I ordered some ice screw stakes and am waiting for them to arrive. I'm slowly working out the kinks of the Taku. Update 1/30/19. Since the weather here broke records this past week, I decided to put the Taku to the test in some really cold temps (-50°F+ windchills). 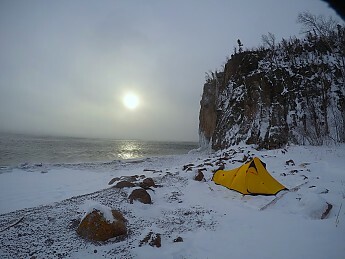 I drove three hours north, hiked in for a half hour, and pitched the tent along side Lake Superior aiming into the wind. After getting the stake webbing adhered to some logs and burying the others, the tent held in 30mph sustained winds through the night. Per usual, I drug way more snow into the tent than I would have liked because there is no vestibule in which to shake it off. The tent was warm at night. I didn't have a thermometer with me, but I would guess it was in the mid 20's. Since the wind was howling so heavily, I zipped up the doors pretty tight with only a two-inch gap at the top. Without ample venting, frosty fluffcicles formed on the ceiling. 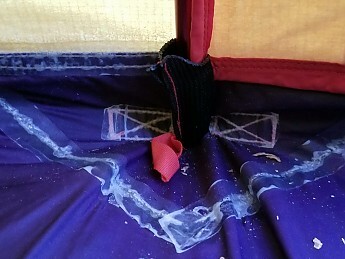 When a big wind gust would hit the tent, the fluff would rain down. 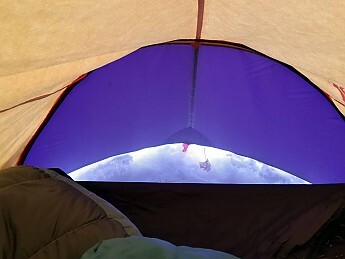 By morning, my sleeping bag was covered in a heavy dusting of my own frozen ceiling condensation. I ran into a problem the next morning. The exterior pole at the foot of the tent would not come out of the inserts. My glove just slipped along the pole. 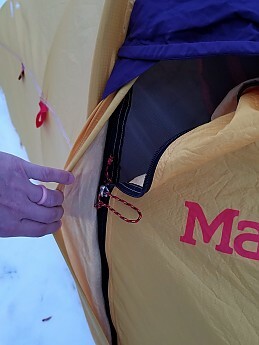 I made several attempts to pull the end of the pole out of the reinforced insert, but when the air is that cold, the fabric on the tent has nearly no give. This makes it virtually impossible to get the pole out. I then tried to remove the aluminum pole barehanded. 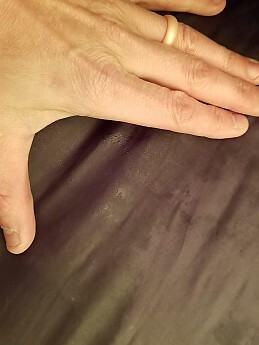 After three attempts my hands started to get the iconic waxy whiteness-precursor to frostbite. 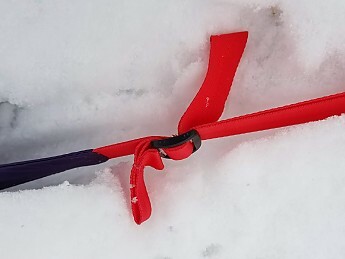 They hurt so bad that I just rolled the tent up the best I could with the pole still in place and carried the tent out under my arm in crotch deep snow. In the process, I lost the burrito bag somewhere along the way, but I made it out alive. 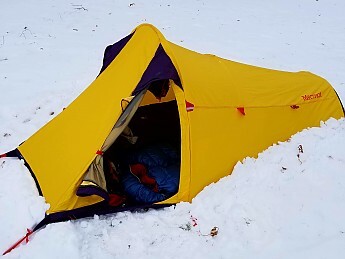 I've used the tent on two summer trips, two in the fall, and now three overnight trips with snow ranging from the 20s F to single digits at night. Update1/30/19: Tested the tent out in -50°F + windchills. Very interesting tent! Does the felt interior perhaps lock condensation in as it freezes, to keep it from dripping when it warms up? Yes, I think that that's exactly it. It really is an intriguing tent. I want to make it work so I have to figure out the floor and how to waterproof it. I mean, for 5lb and super warm, you can't beat that.. My other 4 season 2P tent is nearly double the weight. I just ordered screw stakes so I can pitch it on frozen ground or on frozen lakes this winter. Thanks for the review, Jesse. You manage to find a number of interesting tents. Keep us posted please! Yes, will do. I'll make footprint and press my luck when the temps really drop here. Very objective review Jesse. I hope MARMOT reads this and makes the "Gen. 2" version better. "Water resistant" floor?? REALLY? Amazing. 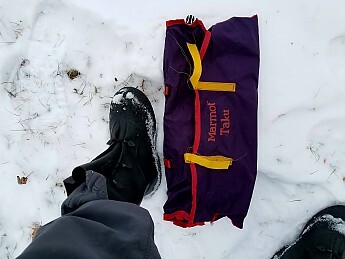 Being a fan of early Marmot gear it was great to see your review of the Taku. Your version is the second generation from around 1996/1997. list price was $599. The floor was 70d coated, so originally waterproof, not water resistant. Perhaps since its 20 + years old the coating has worn thin or the floor has unseen pinholes. From the photos the seam sealing looks to have failed maybe leading to a leaky floor. 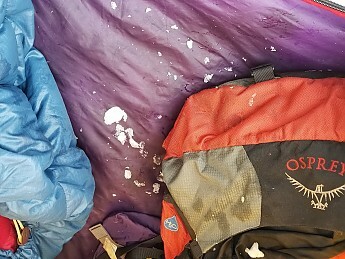 Condensation between the tent floor and sleeping pad when sleeping on snow is normal. Thanks for the update on the coating. I'm just surprised that the entire floor has evenly deteriorated. There's no sign of wear. If I press my hand against it (no seams), it just comes right through. I have the counterpart to this tent "Marmot Sanctum" (same era) with the footprint. I'll have to test that tent out without the footprint to see if it has the same problem. Marmot made two versions of the Taku with the first being made of Green Gore-tex® in I believe 1981. The very first models used fiberglass poles. The version that you reviewed is, as aerial art said, the second generation made in the late 90's using Marmots propriety single wall membrane, strata™ MemBrane®. 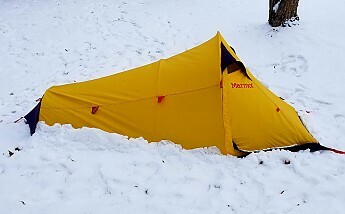 The second generation is bright yellow and has Marmot printed on the tent body where as the first version has no branding on the sides. Both versions had completely waterproof floors. It's a very common experience to find older Marmot tents of these era's with this kind of floor deterioration. The only answer to mitigate the floor leaking is to remove the old urethane and apply a new coating of sealer as water will still continue to leak in, even if you use a footprint. 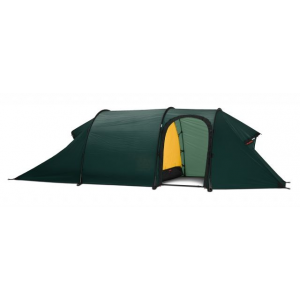 These tents were one of the most highly regarded single wall..........high altitude tents made for many years and were highly prized after Marmot discontinued them from their tent lines. I have a number of each versions. Along with some of my Garuda/Dana Design's, the Taku is my go to tent in all situations when I need a light, bombproof, single person single wall tent. The counterpart to the to the second version of Taku was the single wall, two pole Asylum also using Marmot's strata™ MemBrane®. It also incorporated a detachable vestibule. The only thing that I would add to the Taku's would be one more pole mid body for super high wind situations. Otherwise I've not found a better tent for my situations. Awesome feedback! Thank you. This gives me comfort to know that the floor was at one point waterproof. Since I plan on using the tent in sub zero temps, with the new footprint, there shouldn't be much leakage (only in the case that a bit of snow gets between the footprint and the floor). I thought I saw the Gore-tex tag in mine but I'll have to look again. The chap I bought it from said that it was Gore but I guess I need to take a closer look. Information like this is why I love Trailspace. Right you are: no visible Goretex tag. I bet that it was assumed since the older Mountainworks era Takus had Goretex. At this point, do I go back and change all of my misinformation (floor, Gore exterior... I also figured out how to cinch the double fed straps a little more easily) or allow the reader to read the great feedback from other Trailspace users? To answer your question, Jesse, I'd update the review with the new info, since people tend to skim to info they're looking for. At a minimum you could add an update note at the top with any clarifications, but it's up to you. Thanks! Thanks for the update, Jesse. Stay warm and safe. As for winter ventilation there's not a lot you can do in storm conditions. It's either keep the snow out and the vapor in or the reverse. Both my double wall tents are well vented IF they don't have to be buttoned up in a storm. 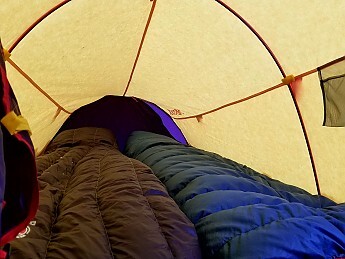 I always put my zipped up GTX mountain shell over the foot of my sleeping bag to prevent the foot of the bag from wetting when it touched frosted tent walls & floors. The pole was stuck in the insert. It's the kind where you extend the arch and sort of force it into the short reinforced insert at the base (1.5 inches). The pole is forced under the foot awning so it's hidden underneath. Because the fabric has no give when it's that cold, you can't force the pole out of the insert because the fabric cover is holding it in place. In the pictures, it's the purple section at the foot of the tent. Good call on the Goretex shell cover for old down bags that tend to get wet. The Marmot Taku is not available from the stores we monitor.